I know the majority of bloggers love the Collection Lasting Perfection Concealer but it can be quite drying, especially under the eyes, which is where the Illuminating Touch Concealer comes in; it's peachy-pink tone helps to cover and neutralise dark circles and bags. The coverage may not match up to the Lasting Perfection Concealer, but I like this one more for certain areas. As for the illuminating bit, it isn't too over the top it just lifts the eyes a bit - perfect for when I go back to school because I always look tired no matter how early I go to sleep the night before! I got this in a little sample pack from the FABB Bloggers event in Manchester back in July and hadn't used it until my Rimmel Stay Matte powder smashed, along with the packaging, just before I was going on holiday so I took this one with me instead. I really like this powder because it adds a tiny bit of coverage and also keeps shine at bay. I have used this on it's own on good skin days and it looks really nice too! I have the shade 'dusk' which I think is the only shade, but there is a translucent shade too. You can get little sample packs for £6.50 and then if you order something you get the £6.50 off your order which is really handy because I think you can only get this online. I know it may be a bit too soon to say this, but I think this could be a holy grail product! 35 comments on "Most Reached For #1: Base Products"
Love my Illuminating Touch concealer, I completely agree with you! That powder sounds great too, might check it out! Thanks a lot for checking out my blog, I'm following you back :) Looking forward to more posts from you! I used to wear a Mac foundation (studio scult) and I found that it stuck to my dry patches as well... Never again! Haha. Must try the collection concealer !!! I love the coverage of MAC but the shade I have is a little too light for me so I have to mix it with another foundation. I even got a proper colour match by a MAC make up artist so it was a little disappointing as it's quite expensive! I really love this post and blog!! Mac studio fix , best for cameras haha , I love Mac ! 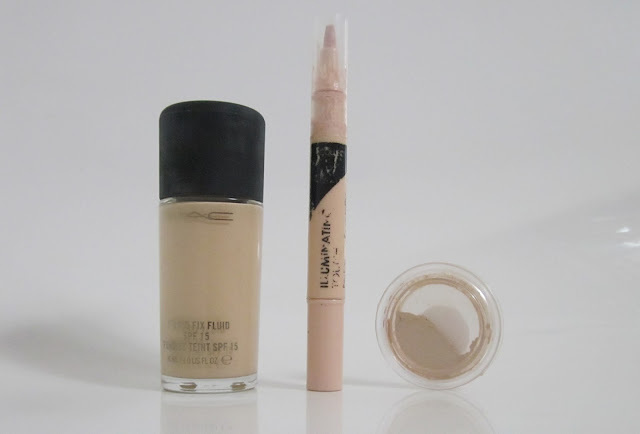 I love the Collection concealers, I use the both the illuminating and lasting perfection and they're both amazing! Total bargains too. shock horror i've never actually tried a mac foundation! looks like a good one. I can't live without base products either! Especially eye primer!